A couple of weeks ago, I made it up to the great Pacific Northwest for a quick weekend summer trip, coinciding with perfect summer Portland weather. Ten years ago, I lived in Portland for a year and after I moved to California, I often traveled to the suburbs of Portland for business reasons. Having the experience of actually living there, I had overlooked what a great tourist destination site Portland is. 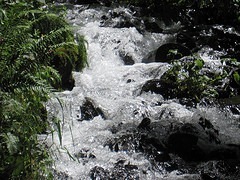 It offers a clean, uncrowded urban experience, the ability to immerse yourself in legendary floral, forest, and garden environments, and the opportunity to enjoy some of the most aesthetically beautiful waterfalls, stream and river scenes, and mountain views. My itinerary during a 3 day trip started with a Friday evening in trendy NW Portland at NW 23rd Street. We had dinner at a very nice Thai restaurant called Typhoon— 10 years since I’d last been there and it’s still producing quality food in a fun environment. 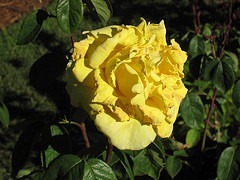 The following Saturday was the annual Portland Rose Festival and Parade. We started the morning watching the annual Dragon Boat Race, in its 20th year as part of the Rose festival. Colorful boats adorned with traditional Chinese dragon boat decorations, raced up and down the Willamette River in downtown Portland. A unique and enthusiastic experience. Following the Dragon Boat Races, we took a stroll through downtown Portland. Near the central square Pioneer Square, walking through downtown is a pleasant experience. An uncluttered downtown, exceptionally clean, accessible by public transportation, with a variety of shopping, eating and drinking options. 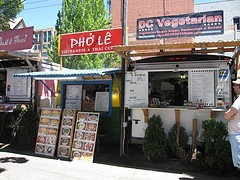 One fun aspect of Portland’s downtown is a multiple block section of street corner food stalls from every ethnicity you can imagine. A nice touch to Portland’s downtown. After our downtown adventure, a trip to the motivation behind Portland’s moniker, the City of Roses, the famous Portland Rose Garden. 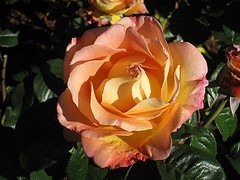 Roses were in full bloom in magnificent color- from yellow, to red, to orange. 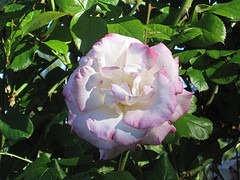 This time of year in June is peak rose season in Portland; a sure sight to behold. From the top of the Rose Garden, there are some absolutely breath taking views of Mt. Hood. Views don’t get much better than this. 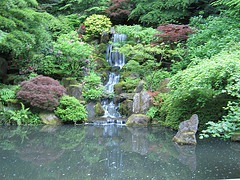 Along with the Rose Garden, the Japanese Tea Gardens is the other memorable experience in Washington Park, the home of both. The Tea Gardens offers sharp contrasting and complementary colors of foliage in a crisp, quiet, zen-like atmosphere, with gentle water falls. A great place to reflect about positivity and the future. 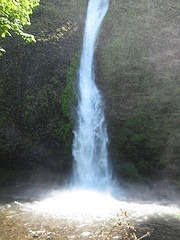 Finally, to end the weekend, made the trip to the Columbia Gorge area and experience majestic waterfalls of the area. Multnomah Falls is the most famous (see my picture of the falls here in the Portland city guide Schmap), but this time I spent the afternoon at some of the smaller and lesser known falls—Wahkeena Falls and Horsetail Falls. The powerful sound of roaring waters, the light mist on one’s face, the crisp mountain air, and the feeling one feels in the outdoors was a perfect end to to the weekend trip. 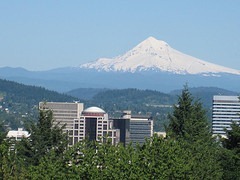 Portland offers a great combination of a casual, urban feel with the aesthetic beauty of the mountains, waterfalls and Rose Garden. Portland is a must see and a necessary stop on your travel itinerary for today and the future. Good pictures, supplemented by a good narration !! @ subu and JoV– thanks for your comments. I would highly recommend visiting Portland and surrounding areas if you ever get the chance.